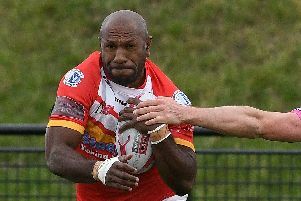 Matty James, the Sheffield Eagles skipper, is more than happy for his side to keep ‘under the radar’ ahead of the resumption of their league campaign on Good Friday. The Eagles have been the surprise package of The Championship so far, but not surprisingly the focus has firmly been on Toronto and Friday’s opponents Toulouse, who are expected to fight it out for top spot. With promotion favourites Widnes’ campaign hampered by a points deduction, there were few tipping the Eagles to be amongst the elite, with James saying that they are still happy to go unnoticed, as the mantra inside the camp continues to be - take one game at a time. James said: “We have a special team here that has flown under the radar. “We have started really strong, and whilst we are taking it week-by-week, we are enjoying it. James, a veteran of three previous campaigns with the club, is one of Mark Aston’s longest-serving, and most trusted deputies. The former Featherstone ace says the introduction of other senior figures during the close season has allowed Aston and his staff to relinquish some responsibilities, stating a policy of self-governance in the dressing room this season has helped share the burden. He continued: “There is an impressive attitude between these lads. “It is not all up to Tubbs (Aston) and Keith (Senior) shouting at us in training, having to lay down the law. Meanwhile, off the back of veteran centre Menzie Yere signing a contract until the end of the season, before going out on loan to Doncaster, Aston has also let forward Lewis Taylor leave for some game time.